If you want to import your Google Calendar into Outlook, you don’t have to re-enter all of your appointments. Instead, export your Google Calendar to a file, and then import them into Outlook on your desktop. It’s not a one-click button but there’s a wizard that’ll walk you through the steps. Do you want to sync your Google calendar and your Outlook calendar? See subscribe to a Google Calendar. If you don't have Outlook installed on your computer, you can't import Google Calendar into Outlook Web App or Outlook on the web. But you can subscribe to a Google Calendar. This option has less functionality than importing the calendar. Here's a video that shows how to import Google Calendar into Outlook. The instructions are below it. Log on to your Google Gmail account, and then choose Calendar. Choose My Calendars > Settings. Select a location to save the extracted file. Go to that location and unzip the file: right-click the file and choose Extract All. If you have multiple Google calendars, you'll see an ICS file for each one. Now you're ready to import your Google Calendar into Outlook. Do this step for each Google Calendar you want to import to Outlook. In Outlook on your desktop (Outlook 2013 or Outlook 2016), go to your Calendar. Choose File > Open & Export > Import/Export. 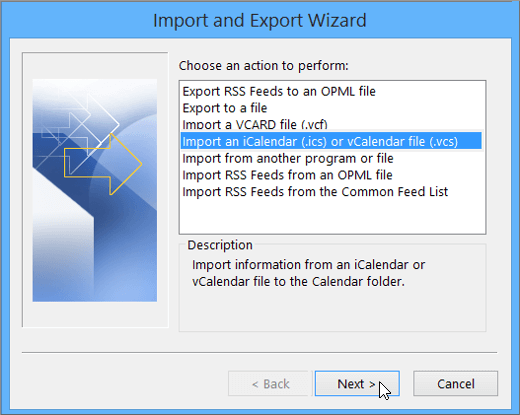 In the Import and Export Wizard, choose Import an iCalendar (.ics) or vCalendar file, and then choose Next. Browse to where you stored the extracted file, and choose the one that ends with gmail.com, and choose OK.
Go to your Outlook calendar. You should now see your Google Calendar events there.